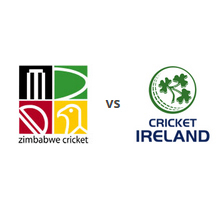 Ireland will play 3 ODI matches in Zimbabwe. We will bring you prediction and betting tips for all of these 3 matches. Zimbabwe maintained their winning spree against Ireland while grasping the second One Day International and is heading towards a clean sweep in the series. Ireland got a blow by two wickets in their 1st One Day International against the hosts Zimbabwe who looks confident than ever to clinch the three match series. After giving Pakistan a run for money Zimbabwe will now host Ireland for 3 ODIs.